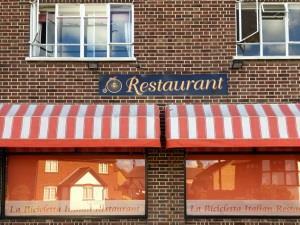 La Bicicletta01277 811697work Restaurant - ItalianLa Bicicletta is a family run Italian restaurant, specialising in homemade Italian food and sourcing local products wherever possible. All the pasta is homemade on the premises as are the delicious selection of desserts, which are also available to buy and take home. Join us for a fine dining experience, we can cater for your specific needs on or off the premises. La Bicicletta is a family run Italian restaurant, specialising in homemade Italian food and sourcing local products wherever possible. All the pasta is homemade on the premises as are the delicious selection of desserts, which are also available to buy and take home. Join us for a fine dining experience, we can cater for your specific needs on or off the premises.